SOCHI, Oct. 18 (Xinhua) -- Russian President Vladimir Putin said Thursday that his country is ready to further strengthen coordination and cooperation with China to safeguard and promote common interests and global peace and development. 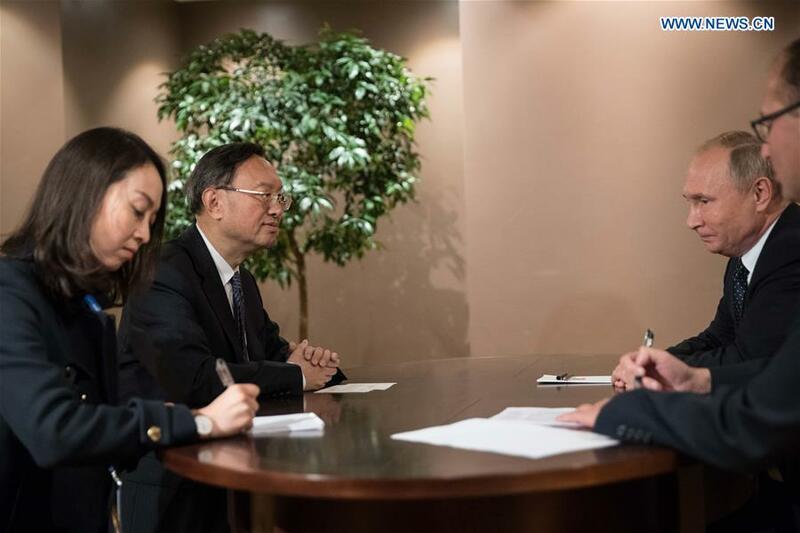 Russia applauds the high level of the comprehensive strategic partnership of coordination between the two countries, said Putin when meeting with Yang Jiechi, a member of the Political Bureau of the Communist Party of China (CPC) Central Committee. All the consensus reached between the two presidents is being implemented, said Putin, adding that his country is willing to make joint efforts with China to maintain close contact at all levels and deepen practical cooperation in all fields. Meanwhile, he stressed that the two countries should further enhance coordination and cooperation to safeguard and promote the common interests of the two countries as well as the global peace and development. Putin also expressed deep appreciation and heartfelt thanks for President Xi Jinping's participation in the Eastern Economic Forum in Vladivostok in September. Yang, also director of the Office of the Foreign Affairs Commission of the CPC Central Committee, said the two presidents had made in-depth exchange of views on further development of China-Russia relations and the international situation and achieved important consensus during the 4th Eastern Economic Forum. Together with Russia, China is willing to fully implement the consensus reached between the two presidents, especially enhancing the practical cooperation in the fields of energy, agriculture, science and technology, innovation, said Yang, suggesting that the two side should properly arrange high-level exchanges and celebration activities next year to mark the 70th anniversary of China-Russia diplomatic ties. Yang said it will be a good opportunity to promote the bilateral relations to score new achievements for greater benefits of the two peoples and people around the world.